instruction at a time. Further, he has decided to allow me to share his work with other interested parties. Therefore, many thanks to you, Mr. Dinev! Get your own copy of this VM in the next two minutes! 1. Open a Command prompt on your computer. 4. Click on the three links, below, to download the three files, and save them into this new directory. 5. 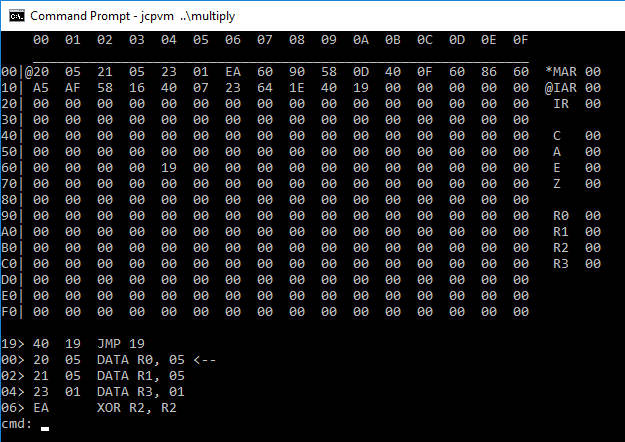 Enter the compile command (jcpasm.exe Multiply.txt -o multiply.run) Ignore the warning. You should now see the working VM in the Command Prompt window, as in the top picture, above. Start pressing Enter to watch it work. GitHub is a website that programmers often use to store the source code to programs that they write. If you've never heard of GitHub, then this section is probably not for you. Vlad wrote this VM, assembler, disassembler and pre-processor, and placed it all on GitHub at the link below. He dubbed it the "John Clark Processing" unit, thus you will see the JCP prefix on a lot of things. There are versions for Windows, Linux and RaspberryPi. If you have a GitHub account and want to contribute to the project, welcome!